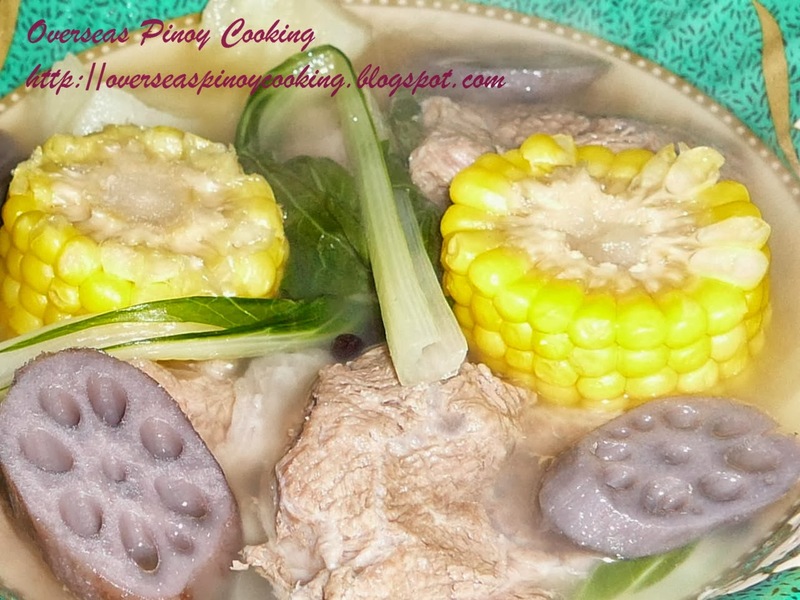 Nilagang Baka with Lotus Root or Boiled Beef with Lotus Root. This caned lotus root on the Asian food section of this supermarket at our neighborhood caught my attention while looking for something to cook for dinner. Suddenly I remembered the beef nilaga with lotus root once served and cooked by my colleague’s wife when I was working in Singapore a couple of years back. That was an unforgettable dish I never thought lotus root can be cooked and goes well with our very own nilaga. 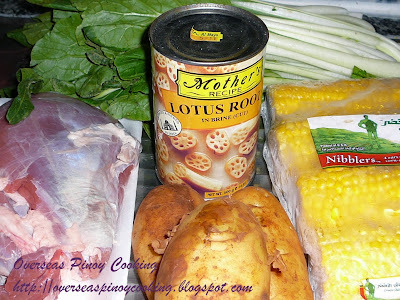 I wonder if lotus is as good as potato in nilaga, then it may also be as good as gabi or taro root in sinigang. Lotus of course is popular in Chinese cuisine and even for the Malays in Singapore. Lotus root is sweet and can be eaten as fruit, sliced and stir fried, steamed or fried as sweet dessert. Tender young lotus roots are good for salads while starchy mature lotus roots are good for making soups. Lotus root powder makes wonderful thick soup and sweet dessert soup. Lotus root also has countless medicinal benefits and not to mention spiritual reference. Pinoy foods are best known for its simplicity and nilaga is truly one simple dish. Nilagang baka is a fairly easy to prepare. It only involves one basic cooking process, slow boiling of the meat and or with bones intact until very tender. 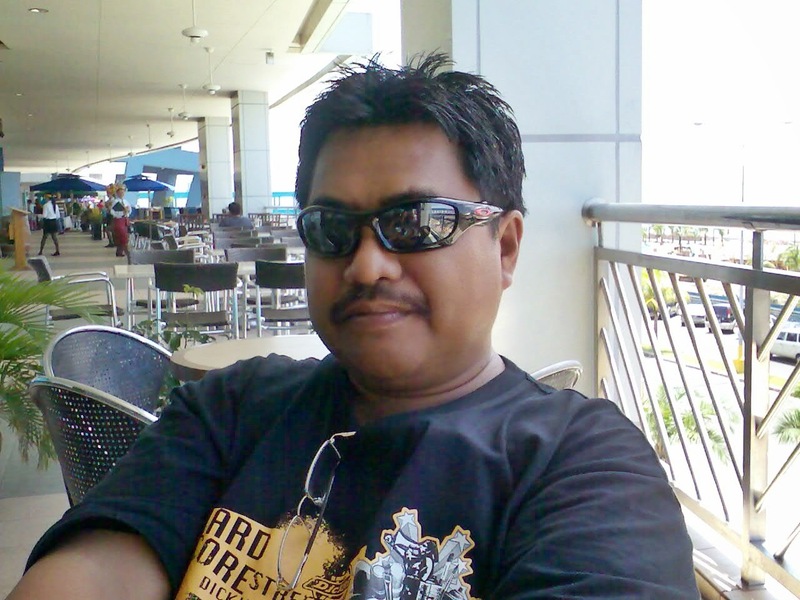 The ideal meat part would be the brisket, shank, bulalo or short ribs and a good mix of vegetables. On this recipe I used pechay for the distinctive taste of the vegetable, potato and sweet corn in a cob to add sweetness to the broth and to add a new dimension lotus root. You might notice the color of the lotus root on the photo it has turned into lavender instead of the usual golden brown. I couldn’t understand why my self as this is the first time I tried to cook lotus. All I know and read from some article about cooking lotus that the end color of boiled lotus root is achieve by the method of boiling, from brown to white to even darker hue. May be some of you might know why it turned into violet, you are most welcome to leave a comment. Wash beef thoroughly and remove all traces of blood. Put in a large casserole, add enough water to cover and let boil for 2 to 3 minutes. Drain and discard first boiled liquid, remove all traces of scum. Return beef on same casserole and add fresh water up to 1/2 full. Add the whole onion, celery and peppercorns, bring to a boil and simmer for 1 1/2 to 2 hours or until beef are tender. Removing scum that rises and adding water if required. Add in potato, sweet corn and quartered onion, cook for 3 to 5 minutes or until potatoes are cooked. Season with salt. Add in pechay and lotus root, cook for another 2 to 3 minutes or until pechay is just cook. Garnish with spring onion and serve at once with a dipping sauce of patis, kalamansi and siling labuyo.